Summer is heating up, and so are the grills. Some of our favorite items to dig into include nice, juicy steak dishes. But with so many different types out there, how do you decide which one to eat? Get to know the most popular cuts (plus how best to enjoy them), so the next time you're at the steakhouse, you can order exactly what you're in the mood for. 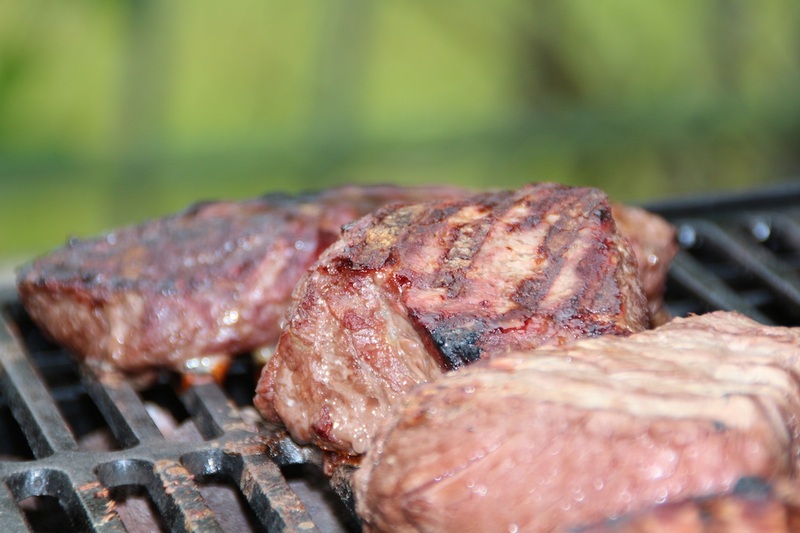 Often grilled but sometimes pan-fried or even boiled, steak -- or beefsteak to be specific -- includes the more tender cuts from a cow's loin and rib (filet mignon, strip, ribeye, porterhouse), as well as less tender cuts from the lower areas (skirt, hanger, flank) which are often served sliced. 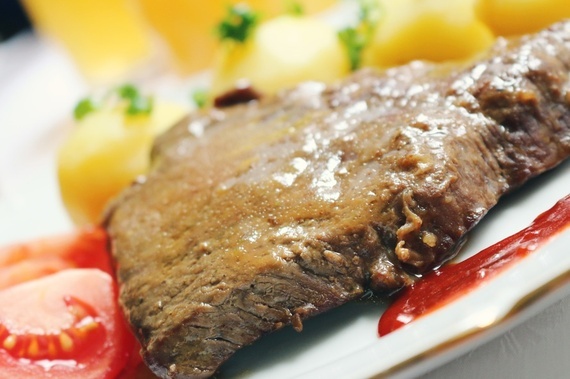 Steaks can be cooked using dry heat, moist heat or in sauce, mechanically tenderized (i.e. pounded) or minced and formed into patties like hamburgers. What's the difference between "prime" and "choice"? Most often found on the menus of upscale steakhouses, USDA Prime steaks are the highest grade of meat. They are supremely tender, juicy and flavorful -- a result of being cut from younger cows with the highest degree of fat marbling. USDA Choice is the second highest grade of beef. 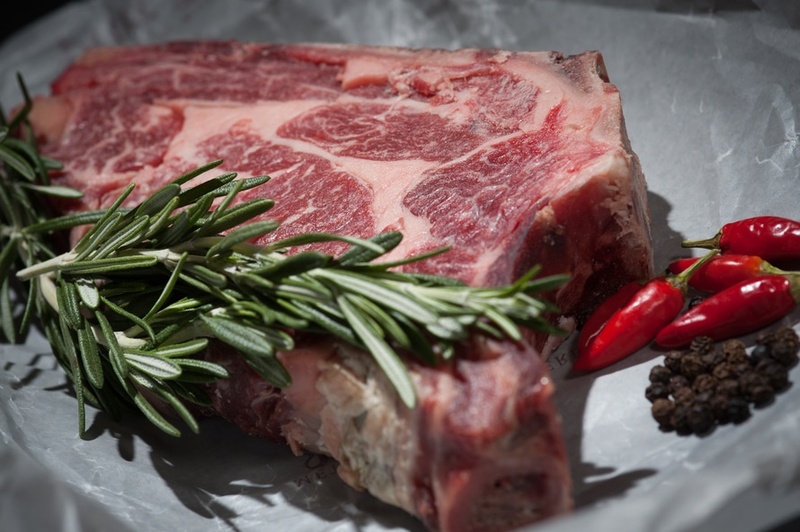 Choice cuts have less fat marbling compared to prime, and while still delicious, are coarser in texture. Available at either grade, below are several of the most popular types of steak. Filet mignon, usually sliced thick, is a cut of beef taken from the smaller end of the tenderloin (the mid-upper back) that's, you guessed it, very tender -- perfect for those who like their steak on the rarer side. If you prefer your steak well done, ask for a filet that's butterflied (cut almost in two and spread flat) so that it cooks through more. The strip steak, a.k.a. The New York strip or sirloin, is a cut of beef from the short loin (upper back) of a cow. Though not as tender as a filet mignon, it's a bit more marbled (fatty) and a great option for grilling up from rare to medium. A porterhouse -- also known as a "T-bone" -- is cut from the back of the cow and marbled with lots of flavor-boosting fat. 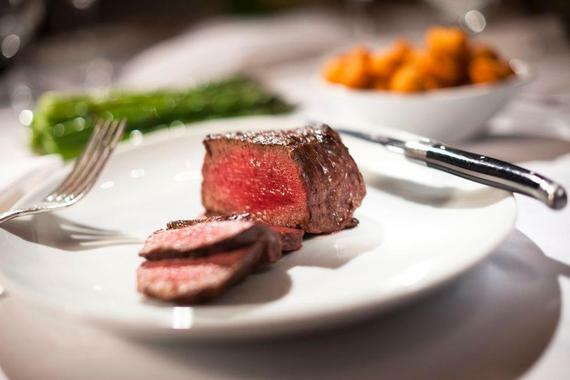 Often described as "getting the best of both worlds," since the filet is on one side and the strip on the other, the signature T-shaped bone adds even more depth of flavor. Another strong choice for medium-rare lovers is the ribeye -- a strip steak off the mid-area or a sirloin cut from the back -- which is the most marbled cut (and extra delicious because of it). Cuts from the animal's lower section, like hanger, skirt or flank steaks, tend to be thinner and less expensive, and thus well suited for dishes with other key elements. 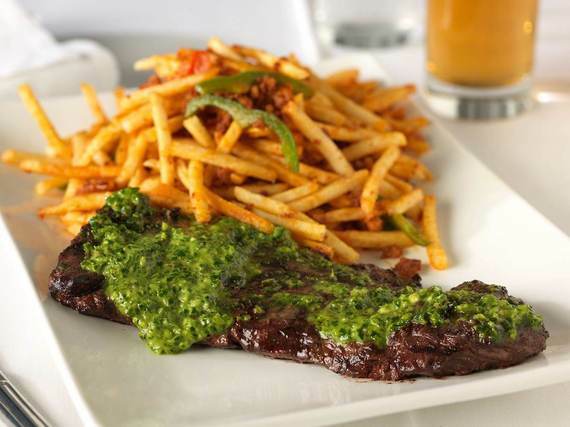 Hanger steak is very tender, and a popular choice in dishes like steak frites (steak and fries). Skirt and flank steaks are prized more for their flavor than for their tenderness, so they're good choices for dishes like fajitas, bimbimbap (Korean rice bowls) and Philly cheesesteaks. From skirt steaks and choice ribeyes to prime porterhouses and filet mignon, there are endless ways to satisfy your carnivore craving. Check out 20 of the best cuts around. 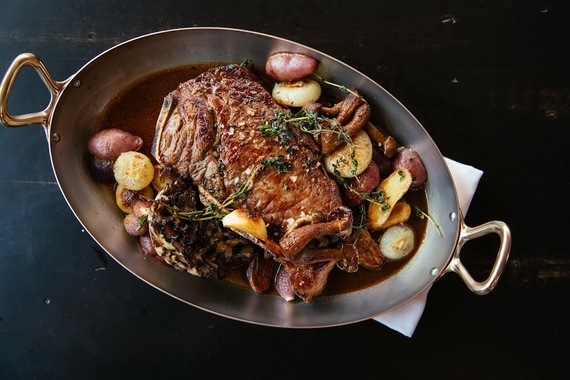 American comfort food with Middle Eastern accents and European spices make for uniquely seasoned meats -- including a special tomahawk (bone-in) ribeye, oxtail and hanger steak -- at Fairsted Kitchen in Boston. Grab an order of the steak frites at Brass Union, a gastro pub in Boston, to enjoy a hearty 7oz. sirloin with porcini (mushroom) butter, herbed house-cut fries, a petite salad and béarnaise (a sauce made of clarified butter, egg yolks and white wine vinegar). Photo provided by Carlitos Gardel. 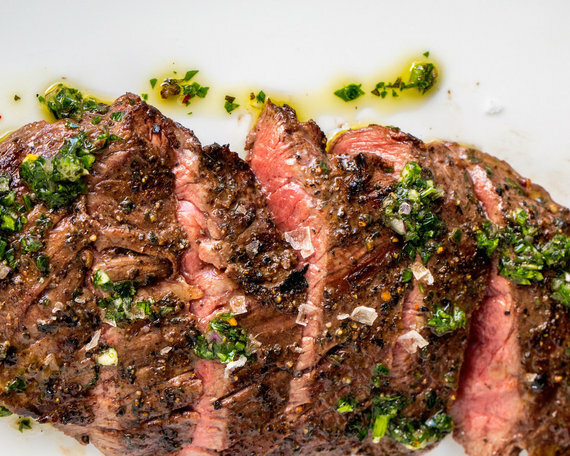 At Carlitos Gardel in Los Angeles, cut into a tender grilled skirt steak, served with Gardel's signature chimichurri (an herb-based Argentinian green sauce). Photo provided by 5A5 Steak Lounge. 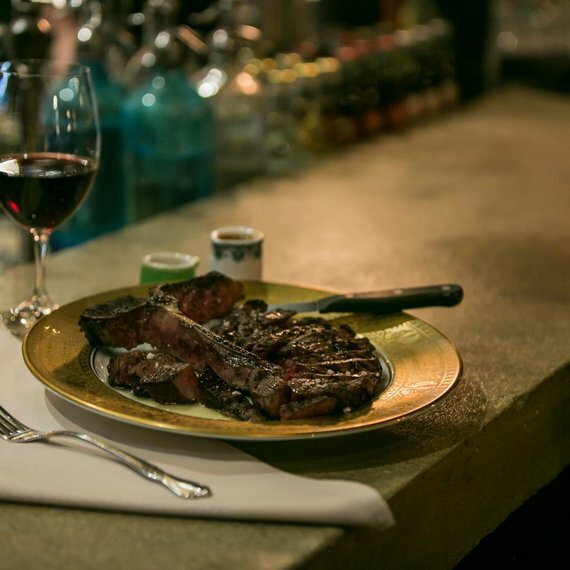 At 5A5 Steak Lounge in SF, treat yourself to a 32 oz. bone-in ribeye, a roasted prime rib, a NY strip steak or maybe even a dry-aged T-Bone -- perfect paired with any number of classic sides. Photo proved by The Dutch. Photo by Noah Fecks. NYC spot The Dutch does meaty entrees right. 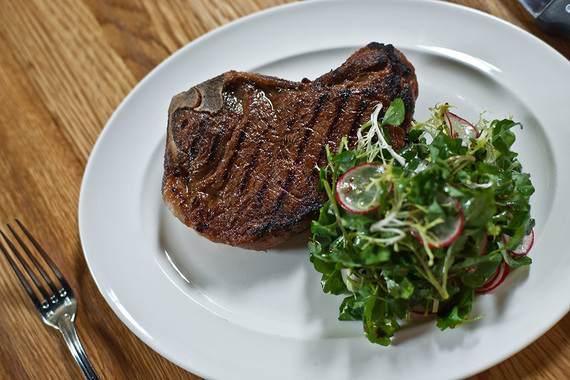 Its prime bone-in New York strip, served with a dressed watercress salad on the side, is as juicy as they come. Photo provided by Red Lantern. Bringing pan­-Asian fare to Boston, Red Lantern serves up a Mongolian skirt steak with ginger, garlic, soy-marinated mushrooms and togarashi-spiced sweet potatoes. 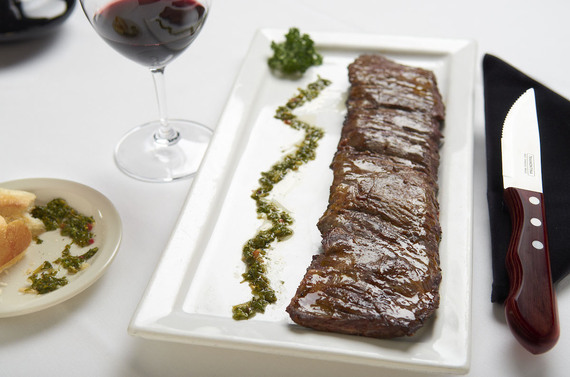 At Malbec Argentine Steakhouse in Philadelphia, enjoy a 10 oz. 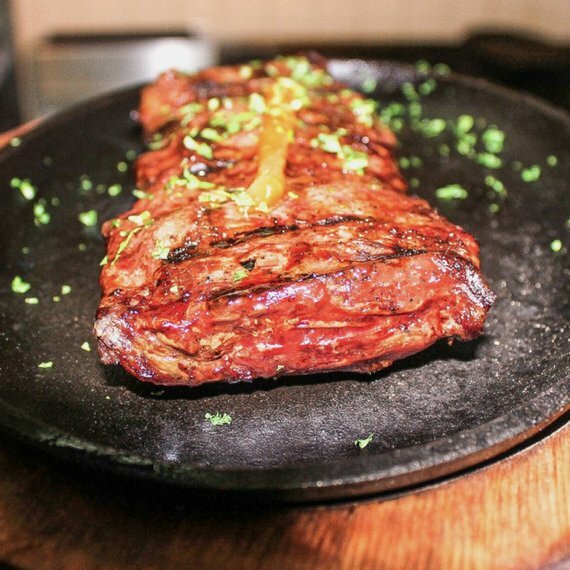 beef skirt steak, seasoned to perfection and delicious paired with a glass of wine or tasty sides. Photo provided by Steak & Whisky. 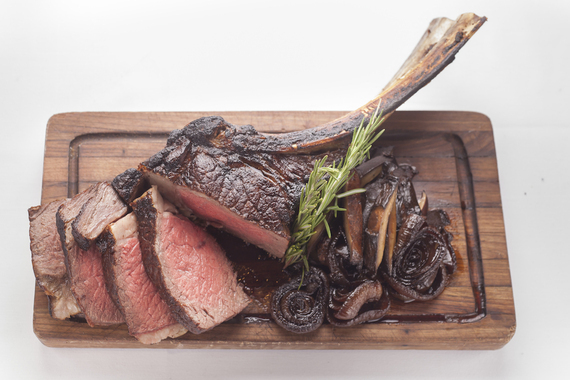 In LA, sit back in rustic American steakhouse, Steak & Whisky, with a mouthwatering 15 oz., prime, 30-day, dry-aged ribeye. 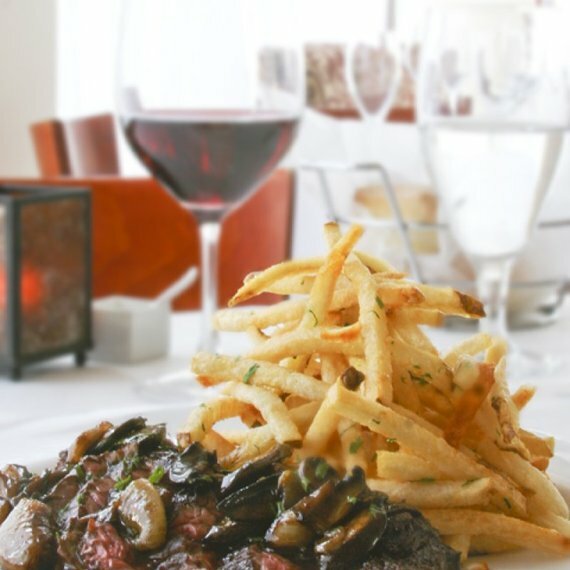 Bite into the BN Ranch grassfed beef steak at Lumiere in Boston, with exotic mushrooms, roasted sunchoke puree and a side of fries. 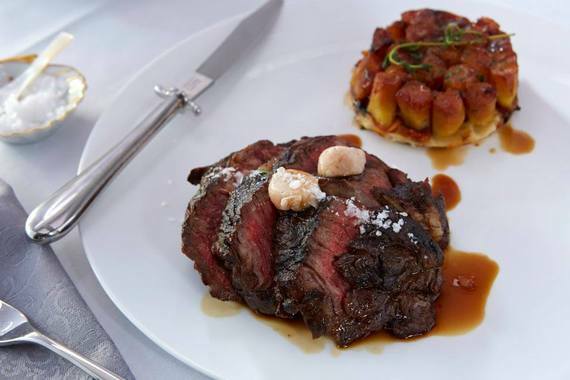 In Chicago, dive into Brindille's rib of beef, served with a tarte tatin of artichokes, potatoes and gruyere, marbled olive oil, béarnaise, red wine, spring bulb onions and fleur de sel (hand-harvested sea salt). 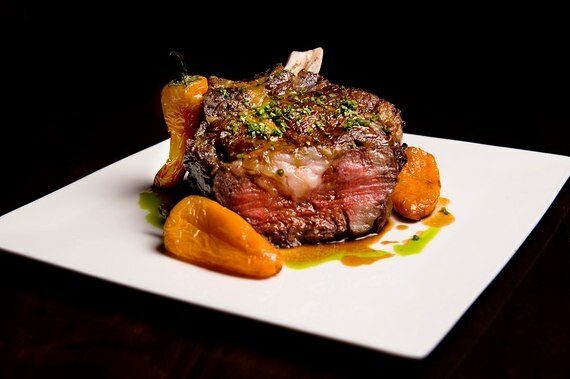 In Boston,Grill 23 dishes exclusively USDA Prime filet mignon, porterhouse steaks, ribeyes and more. Go big or go home at Quality Meats in NYC with its 64 oz. Double Rib Steak, sized for two and served with savory sauteed onions. 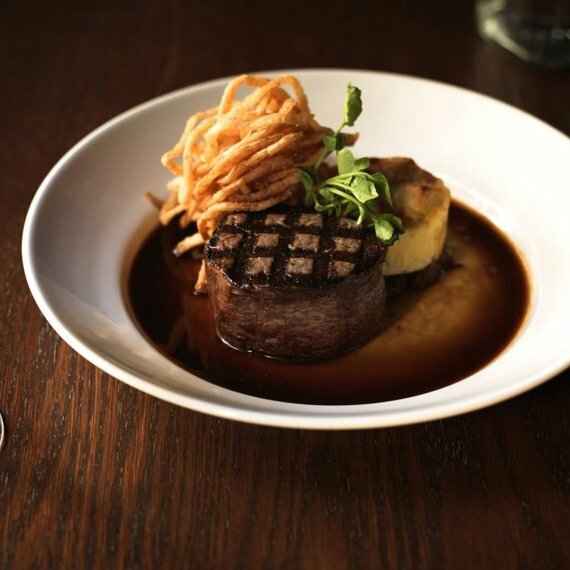 A contemporary twist on the tavern experience, Post 390 in Boston offers a Brandt Farm sirloin steak prepared with gruyere charlotte (a type of French cake), French onion broth and horseradish-watercress butter. Photo provided by Spaghetti Brothers. 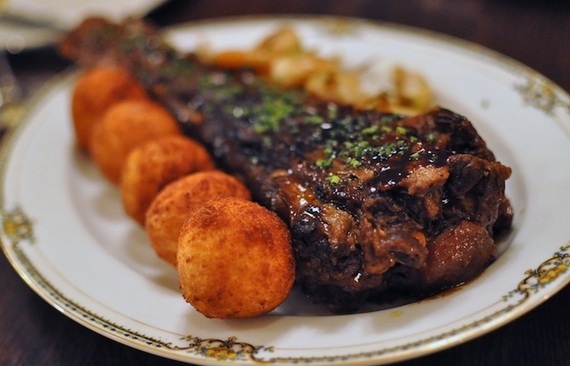 Go halfsies on a steak for two with bone marrow, chard gratin, rosemary frites and bordelaise (a classic French sauce of dry red wine, bone marrow, butter, shallots and demi-glace) at Spaghetti Brothers in San Francisco. Photo provided by Kit Kat Lounge & Supper Club. Named for the Spanish-American actress and comedian, the Charro at Kit Kat Lounge & Supper Club is an 8 oz. skirt steak topped with house-made chimichurri sauce and crispy fries tossed with chorizo sausage and caramelized onions. Featuring both innovative and traditional Asian fare, Empire in Boston serves up a Korean-inspired 10 oz. 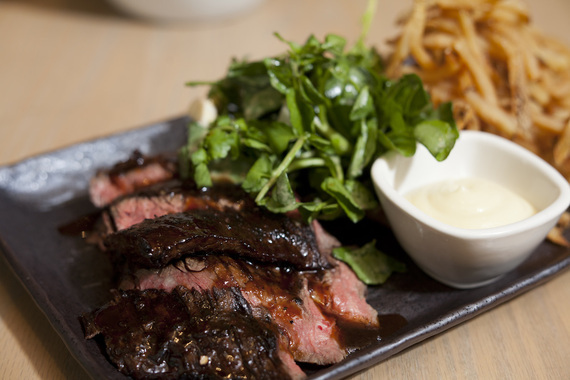 kalbi Skirt steak with thin cut Sansho (Japanese pepper) fries, truffle aioli and a watercress and endive salad. Darren's Restaurant in LA doesn't shy away from hearty American fare and features a 12 oz. 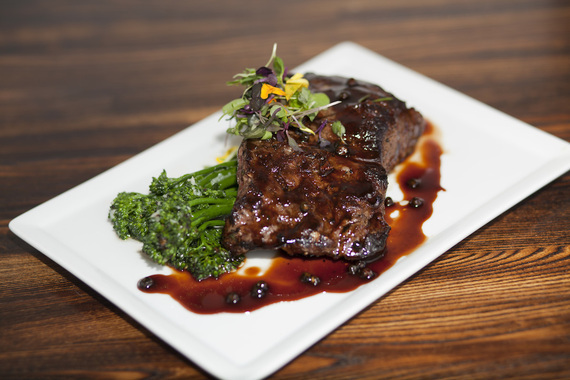 boneless USDA Prime ribeye "cap" (a tender cut from the rib) with broccolini and green peppercorn sauce among its selection of entrees from "Above the Horizon." At Bowery Meat Company in NYC, dig into the giant 38oz. Côte de Boeuf (beef rib)for two, served with Parisian potatoes and salsa verde to spice things up. Photo provided by M. Wells Steakhouse. Eat your way through M. Wells Steakhouse's meat-centric menu in NYC. 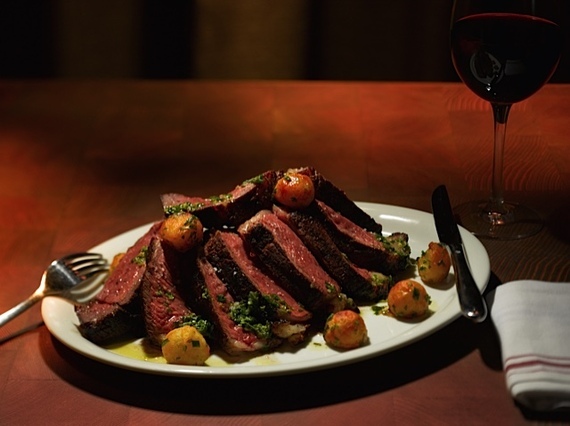 Try the Wagyu (intensely marbled cattle) flank au Poivre (steak coated with loosely cracked peppercorns), NY strip bourguignon (beef braised in red wine) or a fall-off-the-bone tender dry-aged porterhouse. Photo provided by STK Downtown. Go for the 8 oz. skirt steak at downtown American spot STK in NYC's stylish Meatpacking District, where the scene is as good as the meal.